We mentioned it many times that there're many factors affect pellets making, and one of the most frequently asked questions is, what kind of moisture content is the best for pellet mill and fuel pellets. Actually the raw material with suitable moisture should be helpful to improve production capacity, combustion efficiency and even pellet appearance. For examples, the moisture content of agricultural biomass is typically low. Straw delivered to the pellet production plant generally consists of air-dried bales, with a moisture content of between 15 and 20 percent. Compare this with wet sawdust which may register a moisture content of 50 to 60 percent. As the moisture content of straw and wood pellets after pelletization is 7 to 12 percent, if straw material is used in the pellet production there is limited need for drying. Some agricultural biomass feedstock will require a more elaborate drying process, for example reed canary grass. With small-scale production, costs are likely to dictate either batch perforated-floor technology using heated air, or a simple band conveyor using exhaust gas or heated air. It is only at mid-scale production and above that a rotary dryer will come into play. 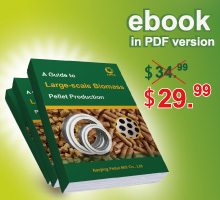 You can learn more about moisture and pellet production from our ebook: Complete Guide to Large-scale Biomass Pellet Production , written by wood pellet factory engineers with 10+ years experience. 7 day money back guarantee is offered to ensure your totally satisfaction. No question asked if you're not completely happy with your purchase we will provide you with a 100% refund. Click the below pic ture to purchase the complete guide. I hope you will be happy with the guide.